Arya and Vishnuvardhan join hands again after their blockbuster hit Arrambam. This is a multi-starrer film with actor Kreshna playing an equally important role as Arya. 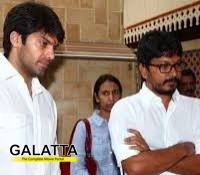 The movie is titled as Yatchan. The movie's story written by Subha, was already featured as a series in a Tamil weekly magazine. Vishnuvardhan in collaboration with UTV Productions will produce this movie. The movie was officially launched on April 18th. It is a rom-com entertainer which will showcase Arya and Kreshna in another light. The movie is expected to release next Pongal. Yuvanshankar Raja will be composing the music for this film.